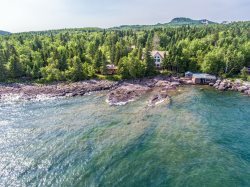 Chateau LeVeaux Condo #21, also know as the Gitchi Gummi Getaway, is a large and gorgeously updated lakefront condo located in the Chateau LeVeaux Resort on beautiful Lake Superior. The beautifully updated living room features high ceilings and a private balcony. Spacious living area provides room for guests to entertain. The high ceilings open up to the loft area above. Cozy up to the stone fireplace in the winter or step out onto your private balcony in the summer. Galley kitchen is open to the living room and provides plenty of prep space for cooking. This kitchen also features a dishwasher. Dine at the bar area or at the table that pulls out to seat four. Enjoy the Northern Lights artwork in this beautifully decorated main level bedroom, as well as the Lake Superior views out the window. The main level bathroom has been remodeled and includes a shower/tub combo. The oversized loft space has two twin beds and plenty of room for an additional roll-away bed, provided. The second level bedroom is private from the loft space, with a door, and is the largest in the entire resort. The loft bathroom has been fully remodeled and expanded with a walk in shower. Chateau LeVeaux is a 34-unit vacation rental resort located on Lake Superior`s North Shore. The large lobby is a great meeting area for large groups renting multiple units. Enjoy your breakfast in the community lobby area. Complimentary coffee is available for you to enjoy in the mornings. The community deck has plenty of room for large groups to gather. Or just you and your loved one sipping coffee and enjoy the Lake Superior views. Enjoy an outdoor meal on the community deck. Take a dip in the heated indoor pool. The pool area also has a hot tub, sauna, and a game room, great for kids. On the grounds of the resort there are lots of places to grab a seat and enjoy the view. Or head down the stairs to the private lake front area. The lake front area in from of Chateau LeVeaux is ledge rock, great for sitting and watching the waves roll in. The gorgeous views looking up the shoreline. And don`t forget the views looking down the shoreline. The community fire pits are also a great place to gather and enjoy time with friends, family, and other Chateau guests. Map of Chateau LeVeaux property. The "Gitchi Gummi Getaway" is home to your next vacation! This spacious Superior Condo offers a lovely pine cone themed decor, wood burning fireplace, private balcony, extra dining seating, two full bathrooms and a fully equipped kitchen. This condo is a truly unique Chateau LeVeaux gem. With an expanded loft space and separate second bedroom, this condo is great for large groups and truly one-of-a-kind in Chateau LeVeaux. The kitchen has been remodeled and you will have access to a dishwasher, which is also a rarity in the resort. So whether the plan for your trip is a romantic getaway for two or a vacation with the whole family, this unit is perfect! Be sure to check out the unique art throughout the condo, as well. You will be captivated by the North Shore beauty captured in the artwork and will want to witness these sights first hand. You will also be able to enjoy the special amenities that Chateau LeVeaux Resort offers, including a large deck with lake view, perfect for watching the sunrise or sunbathing, Lake Superior ledge rock shoreline, pool, hot tub, sauna, and game room. The resort is located on a quiet stretch of Highway 61, just a few short miles from many local North Shore attractions. Here you are just a short drive away from the beautiful Oberg Mountain Scenic Overlook and hiking trail, a must-see during leaf changing season. Head down the shore and check out Temperance River State Park or head up the shore and you will find Cascade River State Park- both great for hiking and enjoying some beautiful waterfalls. The Gitchi Gami Bike Trail goes right in front of the resort and runs along Highway 61. The trail is enjoyed by bikers and walkers alike, taking a scenic ride or stroll along Lake Superior's shoreline. The Lutsen Mountains recreation area is just 10 miles away and offers both winter and summer activities including skiing, the alpine slide, and a scenic gondola up to the Moose Mountain Summit. Enjoy the many restaurants and live music offered year-round on the mountain, as well. Please note that the condo is listed as a 2 bedroom, however, there is also a large loft area with two additional beds and room for an optional rollaway bed (included in the condo). This condo is great for large groups! Holidays require a 3-night minimum stay on all Chateau LeVeaux properties. The guy at the front desk was awesome. He really took care of us and made sure our stay was great. His name is escaping me at the moment! We had a wonderful time at Chateau Leveaux! We stayed with 5 other families. The layout is ideal for groups of families. Every family can have their own space in their own condo while gathering in the common area for dinner or drinks. Everything is connected, so you don't need to go outside to visit others. We have tried other resorts and none have measured up to the Chateau! They were great, always helpful and courteous. I stayed here about 30 years ago. I'm pleased with the changes that have taken place since then. The location is on a terrific part of the shore, good views, close to many different attractions. Chateau 21 was very nice. The manager at the front desk was very kind and helpful!!! I have heard many great things about CL over the years. We finally made it there! And we will continue to go there every year! This property had the perfect combination of amenities and quiet. My daughter and her two children, ages 12 and 14 and I, senior 86 yrs old. Have been going to the Chateau for 11 or 12 years. we love the cleanliness of the property. The location is great, although it is a long drive from Mpls. The kids have the pool and the game room, at this age they can go on their own. we usually go to the pool with them. The weather this past weekend was great. Everybody else was in shorts and bare arms but I had long pants, a warm shirt and a wind breaker. The kitchen faucet has a distinct drip that we could not turn off. The bed were very comfortable. The manager at Chateau Leveaux couldn't have been friendlier or more helpful. We really enjoyed chatting with him. We loved staying in Chateau 21. The furnishings are pleasant, the beds comfortable, the view awesome, and the additional space in number 21 make it a fabulous place to stay with our family! Working with Cascade Vacation Rentals, and talking with Dennis at the Chateau Leveaux was a great experience. We will be back, as it was an overall awesome experience! We stayed in Unit #21 owned by Bill & Linda, and it was very well equipped for our weekend stay with friends. Bring your own toiletry items, and what you want to eat and drink for your stay, and you're all set. This unit has a real relaxing, cabin feel to it, and the view of Lake Superior is Spectacular! Very happy with our stay- would come back and will definitely recommend to others. We really enjoyed our stay. We have a family of 7, so cottage #21 was perfect for us. Bedding could have been updated to seem more hygienic (comforter and blanket). always easy to work with CRV. the people at chateau LeV were really friendly and helpful. Second time I have used this rental property. I like the loft and upstairs bedroom. Great view of the lake and had all the comforts of home. Maybe have a sign on the stairway to the lake if conditions are icy. Great value and great amenities! I thought the home was very homey & comfortable. I loved having access to a kitchen. They view was spectacular. We stayed in a 2 bdrm unit with a loft and it was great to have the extra space upstairs for the kids. We had 4 adults and 2 children and it was great having 2 bathrooms as well. The pool/sauna & hot tub were nice. The only thing I would suggest improving would be the bathrooms. The main floor bathroom was nice but the shower head was very low. The front desk worker was very friendly to talk and very helpful. It was very easy to find and was a perfect distance from our skiing destination.